The idea behind the ‘(at)eleven’ Q&A series was to allow me to highlight books I like, written by people I know (because I am so lucky to know some lovely people who write), without having to worry about bias. 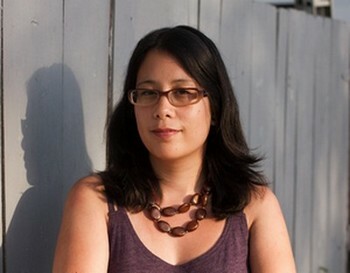 Having said that, I don’t really know Teri Vlassopoulos, that is, we’ve never met in person although we’ve ‘known’ each other since taking the on-line Humber School for Writers mentorship program circa 2006, at which time a sort of group emerged. Amazingly, the group (we keep threatening to name ourselves) is more or less intact and continues to inform, critique, support, and celebrate one another’s achievements—of which there have been a delightfully surprising number—not the least of which was the recent short-listing of Bats or Swallows for both the ReLit Award and the Danuta Gleed Award. A funny thing about The Group is how many of us are foodies. (Although, given that food is one of the world’s great tools of procrastination, I suppose it’s a natural love interest for writers.) In any case it ties in well with the small but important side theme, i.e. what food an indvidual book inspires. 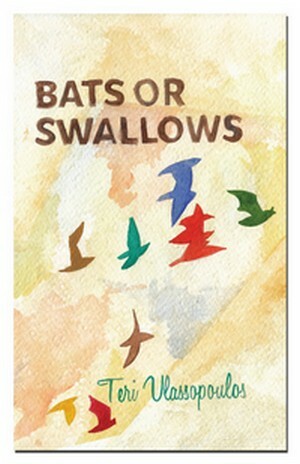 My answer to the all-important question: what does Bats or Swallows make me want to eat?… follows the Q&A. 1. Okay. My favourite question first: what literary character did you identify with as a child? TV: Girl by Blake Nelson, which I discovered when Sassy magazine published a few excerpts. Andrea Marr is a teenager in Portland who stumbles onto the local rock scene, wears a fish-printed dress, gets obsessed with rock star boys and has confusing and intense friendships. It was a bible of sorts. 3. What about themes… are there often recurring themes in your work that surprise you? TV: The surprise comes in retrospect when I read what I’ve written and realize that I’ve been working through an issue that I didn’t necessarily admit to myself was something I needed to work through. 4. Describe your work space, what’s on your desk? TV: Our apartment is tiny and I don’t have a proper desk, so I do the bulk of my writing on the kitchen table. I’m sure one day I’ll get sick of this arrangement, but in themeantime I prefer it. What’s on my desk depends on the day. Right now there’s a vase with a Christmas branch, my husband’s camera, a glass of water and a lone mechanical pencil. Soon: dinner. 5. What are your biggest distractions while writing: internet, chocolate cravings, a sudden need to learn another language, rain…? How do you deal with them? TV: THE INTERNET, UGH! I deal with it by telling myself that my writing time is precious and that I shouldn’t squander it. It sometimes works. 6. What’s the best advice you received (writing related or not) that you’d like to pass on? TV: I read Writing Down the Bones by Natalie Goldberg years ago and her comparison of writing to running was life-changing. “Like running,” she says, “the more you do it, the better you get at it.” It reframed the way I thought of the act of writing: an exercise that requires stamina and practice. This advice still reverberates with me, especially when I haven’t written for awhile and realize that I’ve gotten rusty. 7. The stories in Bats or Swallows explore relationships with family, friends, partners, for the most part from the perspective of young women. ‘My Son the Magician’ stands out for its POV of a mature single mother with an adult son. You nail the voice perfectly, BTW, but I’m curious – how did this one come to you? TV: Thank you! It was one of the last stories I wrote for the book and I was getting sick of young woman narrators, to be honest. I do a lot of thinking about my writing during my commute to and from work. The first sentence of that story came to me while I was waiting for the metro – I’m not sure why (I guess I was thinking about male strippers? ), and once I had the hook, the rest of the story kind of poured forth. 8. There’s a sense of movement throughout the book. People physically moving from one place to another, from one person to another, distance, travel, road trips, moving on. Were you aware of this as you wrote or was it one of those things that become apparent only afterwards? TV: I write about things I want to read about, and travel—not necessarily big travel, but small voyages, physical and mental—is one of those things, so I was conscious about it at the time. 9. If you had to spend a long weekend with one of your characters, who would it be and what would you do? TV: Zoe from ‘Swimming Lessons’. We’d walk around Montreal and I’d show her my favourite places and try to introduce her to better friends. I’ve actually chosen to spend more than a long weekend with her because she’s now one of the main characters in the novel I’m working on. TV: Because I like reading short fiction; because it gives me flexibility to experiment with voice and style; because writing short fiction is conducive to a full-time job schedule; because I didn’t really think about it when I first started writing, it was just what I did. Breakfast or Lunch? Breakfast! My love of breakfast is well documented (http://www.bibliographic.net/2011/02/26/scrapbook-4-in-praise-of-breakfast/). Dylan (Bob) or Dylan (Thomas)? Bob. Pasta or Pizza? Pasta, homemade. Bicycle or Canoe? I have an irrational phobia of bikes and I can count the number of times I’ve canoed on my hands. I like walking. Twitter or FB? Twitter, as proven by @terki. Coffee or Tea? Coffee, although only on weekends because it makes me kind of crazy and this is not conducive to my day job. Okay, Bats or Swallows. I’ve read you. Now what to eat?? My pick: gourmet burger made of the best pasture-raised, sunshine-in-its-face-all-its-livelong-life, happy beef. And a side of fries— travellin’ food. From the Re-Run Series: originally posted January, 2012. Congratulations to Teri on her accomplishments with her first collection of short stories. And good on you Carin for promoting other writer’s works. Natalie Goldberg’s Writing Down the Bones is a favourite of mine also. Mine too. Such simple stuff, but potent. I especially like her enouragement to get away from the desk to write — anywhere else — sometimes.